We do love the Lee Bros. We love Charleston. So The Lee Bros. Charleston Kitchen is kind of a no-brainer. What we really love is cookbooks that offer up a big, fat bibliography. Face it -- you didn't "invent" macaroni and cheese, you just cook it like Mama did. There a few cookbooks out there that offer up truly new recipes. Cookbooks are historical references and we feel they should be treated as such. We firmly believe that every cookbook should have a big, fat bibliography. Charleston Kitchen offers up most books published about Charleston cooking and quite a few that were never really published and they threw in all the spiral bound collections they could muster! Then the brothers set out to interview a whole mess of cooks in Charleston, and face it there are a lot of cooks in Charleston. 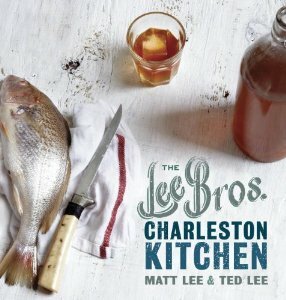 As we stated earlier (and to pretty much anyone who will listen) cookbooks are historical documents and Matt and Ted Lee have provided a profound historical context for Charleston. From the Junior League's Charleston Receipts to longtime shrimper, Thoma Backman, Jr., the vast history of Charleston is uncovered and told through the food of the coast. In 1985, Henry's, a rather famous or infamous restaurant in Charleston closed, but the Lee Bros. remember going to the restaurant and eating the cheese spread that was brought out as an appetizer to each table.In true form, the brothers tracked down Henry's son who provided them with the recipe to feed a restaurant. The Lee Bros. whittled it down to a manageable size. Combine all the ingredients in the bowl of a food processor and pulse until the mixture is smooth and spreadable. Transfer to a small bowl to serve. While we have been thrilled at thrilled at the great Southern food (and therefore, cookbook) revival, there seems to be a lot of sameness. The Lee Bros. have offered up a fresh Charleston breeze.